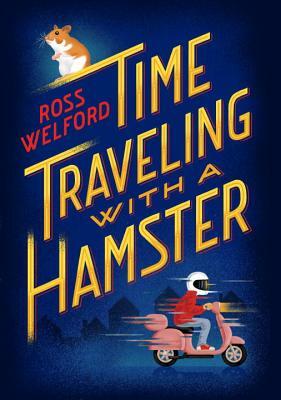 Time Traveling With a Hamster by Ross Welford (October 4, 2016, Schwartz & Wade, 432 pages, for ages 8 to 12). Synopsis (from the publisher): My dad died twice. Once when he was thirty-nine and again four years later, when he was twelve. On his twelfth birthday, Al Chaudhury receives a letter from his dead father. It directs him to the bunker of their old house, where Al finds a time machine (an ancient computer and a tin bucket). The letter also outlines a mission: travel back to 1984 and prevent the go-kart accident that will eventually take his father’s life. But as Al soon discovers, whizzing back thirty years requires not only imagination and courage, but also lying to your mom, stealing a moped, and setting your school on fire—oh, and keeping your pet hamster safe. Why I recommend it: Color me impressed. An endearing main character and a clever, engaging plot help make this British import absolutely brilliant. Those opening lines drew me in immediately: My dad died twice. Once when he was thirty-nine and again four years later, when he was twelve. After a beginning like that, how could you possibly stop reading? Time travel that makes sense is extremely hard to pull off but Welford really thought this through. He must have had charts, maps, and timetables plastered all over his writing office. There's an answer for everything, even the famous "Grandfather Paradox" of time travel. You'll be amazed what happens in this humorous and touching tale. Al (along with Grandpa Byron, the coolest grandfather ever) is a character you'll grow to love. And yes, the hamster has an important role to play. Reading this turned my weekend into a fun escapist mini-vacation. Bonus: Stay tuned next week for an exclusive interview with Ross Welford and a giveaway! Holy hamsters! Between the opening lines and the title, I can't imagine readers won't love this. Adding it to my list now. Thanks! Hope you get a chance to read it, Joanne. I can't wait to read this one. Sounds like a fun story wrapped up in a serious package. I'm looking forward to the interview next week. Good way to describe it, Greg. It really was a lot of fun, despite the subject matter. I also love the opening (and I have a pet hamster) so I really want to read this book. Thanks for posting today and I'm going to the library soon to see if they have this book. I'm having a giveaway next week, Danielle, so remember to come back then to enter. What a great story. Love the title and cover. Thanks! Yes, that's an eye-catching cover, isn't it? This sounds wonderful! I love time travel, especially when it's done well. And that first line! I know my sons would love this. That first line is a humdinger, Jenni. Love that the book lives up to its title and first line, and that the hamster turns out to be important. Seems long for a middle-grade, though it sounds like the plot is convoluted enough to make it a quick read. That many pages makes it sound long, Kim, you're right. But I flew through the story and I'd bet kids would too. It looks pretty cute. Thanks for the review. This sounds like a fun book. Time travel has always fascinated me. :) Thanks so much for sharing. Time travel done right is pretty cool, Jess. Isn't that a great title, Erik?